NASA will launch the first human-like robot to space in order to become a permanent resident of the International Space Station. 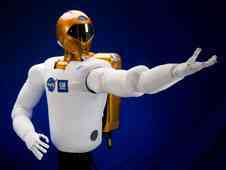 Robonaut 2, or R2, is a robotic assistant that can work side by side with humans. R2 was developed by NASA and General Motors under a cooperative agreement. The R2 consists of a head and a torso with two arms and two hands. R2 will be lauched on space shuttle Discovery as part of the STS-133 mission planned for September. Throughout its first decade in orbit, the space station has served as a test bed for human and robotic teamwork for construction, maintenance and science. The robot not only looks like a human but also is designed to work like one. With human-like hands and arms, R2 is able to use the same tools station crew members use. In the future, the greatest benefits of humanoid robots in space may be as assistants or stand-in for astronauts during spacewalks or for tasks too difficult or dangerous for humans. Further detail is found through the following NASA link. including a video showing the performance of R2.